Earlier this week I felt my life had no purpose. I had managed several crises for the past few years and the situations are now under control. I thought again of the 3 reasons to live given by Viktor Frankl that I wrote about in ‘Survive your camp’. You can survive a difficult situation by having a meaning in life, a great love, or acceptance of your suffering. Because the crises had passed, I was no longer suffering. I recently studied stoical philosophy to help me cope and understand life. This resulted in me focusing more on my place in the universe, on acceptance of fate and on how little influence I have outside my own mind. While this acceptance significantly lessened pain I might feel, I could no longer love anyone or aspire to love anyone with great intensity. So that just left life’s meaning – the great work that I would do. I do a lot of work at my job, my writing, my horticulture and looking after my house. But right now none of it seems to be the main meaning in my life. I even wished for another crisis so I would have something on which to focus. So my suffering would again become the driving factor. But I quickly discarded this idea. Why would anyone wish for pain? I should be thankful that I was no longer suffering. I have great talents and multiple opportunities, even if none of them really felt strong enough to be a meaning of life. Then I asked what I could do that would make my life feel fulfilled and ultimately reward me. What do the people we most admire do? They dedicate their lives to helping others or doing things that bring happiness to others. We all know many people who dedicate their lives to helping or entertaining others. Yesterday on the radio I heard a British nurse who survived Ebola say he was going back to West Africa again to help others. Many people are similarly giving. Then it struck me. Most of what I do is to help others. In my work I develop useful products to make people’s lives better and help my colleagues to do their jobs. I do my job to earn money to help my family. I help with social clubs for the benefit of others. Even the work I do in my garden will ultimately help others by producing fruit, jams and wines. I will be rewarded for helping others, both in personal satisfaction and perhaps financially. By writing this column today I am helping you the reader. Perhaps you are happy living a life with another focus. Perhaps you have a job, or hobbies and pastimes that you find so engrossing and satisfying that you are happy and fulfilled in yourself. In this case you should continue with the life that you have. You may if you examine your life realise that you are bringing happiness to others just by doing what you do. But if your life feels empty, focus on the help you give to others. Think how others benefit from what you do. Spend more of your time doing things for other people. A more selfless focus to your life will make you feel so much better about yourself. It will give your life meaning. Strive to help others and to make their lives better. 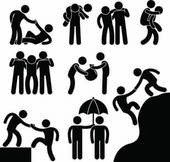 The life most benefitted by the help you give will be your own.